On my mind today are kids and athletics. It’s fairly well-documented that when a child and a sport find a natural match, the child experiences increased self-esteem from performance in the sport. I believe this is not only applicable to sports but can include any interest or activity in which a chlid excels. 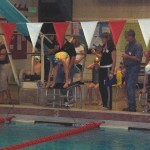 But since my youngest is a swimmer (and so was my oldest, and so was I!) I am going to focus a few posts about quandaries in youth athletics. The first two questions are: In the wake of the fairly recent allegations against Jerry Sandusky, how do we keep our children safe during extended exposure to coaches and sporting authority figures? My second burning question is, when a child starts to increase performance in their sport, how do you balance working hard against burning out? Today I’ll address the safety question, and continue with the performance question in future posts. My goal today is to raise awareness of what you can do to prevent your child from being in a compromising solution AND to go over how to talk to them if it does happen. Yesterday I took an eye-opening online training class from Praesidium on Athlete Protection. I am an non-athlete member of USA Swimming and to renew my membership I had to pass this course. What frightened me the most is that there are people out there who purposefully seek out relationships with youth in order to become physically close to them. These people “groom” their victims by awarding special attention, praise, and then *BOOM* they apply power and manipulation to corner the kids into some form of sexuality. Once a child has been compromised then they are stuck…they feel shame, they risk losing the coach’s attention, and they’ve done things they don’t feel they can tell their parents. Secondly, you can be aware that child molesters need three things to achieve abuse: access, privacy, and control. Control is the hardest for you the parent to affect, but you can keep tabs on the amount of access and privacy your chlid and coach have. Volunteer to be a chaperone at away meets, games, or events. Don’t accept a hotel room situation where the athlete shares with the coach. Control the amount of unsupervised private lessons. And so on. If you suspect any unusual behavior, tell your Head Coach, Board President, and whomever else is in charge of the youth organization. Tell several people because as we know, one may turn a blind eye! Finally, if your athlete does disclose abuse, it’s a very brave thing they have done. It’s crucial to support them by following this formula (resist the temptation to be upset at your child): Listen to what he or she has to say. Reassure him or her that talking about what happened is the right thing to do and that they are brave. Protect your athlete from further contact with the accused. And then report what you’ve been told, using the athlete’s actual words, not your own interpretation. Mama J (Diane Fromme) is a Northern Colorado-based writer who likes exploring family dynamics and youth issues. Great post, Diane! Both our kids participated in athletic events and we made sure to always have either my husband or me chaperone all out-of-town, overnight trips. I’m curious–did your training say anything about the “swimsuit zone” as covering the places that adults shouldn’t touch them? Excellent post, Diane. Thank you. Marie S.
Ironically, Erika, even though the training was specifically designed for swimming athletes, it did not mention the swimsuit zone. It was directed at the coaches themselves, and it mentioned that even appropriate hugs need to be watched as a form of touching because they can develop into something less appropriate. The general recommendation is that a high-five is enough touching, with the exception of professional body manipulation for stroke instruction, and of course that also needs to be on observation.